A friend of mine just sent me a link to the Top Ten YouTube Videos of All Time. Reviewing the list, I realized that I hadn’t seen any of them, so I sat myself down and watched them all. Oh no no no. I’m a rocket lamb. Rocket lamb, glad I’m wearing wool ’cause it’s awf’ly cold. Or their heads will bug out bad like Arnold’s did. A rocket lamb, a rocket lamb. Oh no no no no no. I’m a rocket lamb. Lamb on the run, lamb on the run. and now she’s stuck eating the cow..
Who, Exactly, Is the World? OK, it’s impossible not to compare, so here we go. Two groups of people who boldly claim, “We are the World.” Which group do you prefer? Obviously, these are both wonderful causes, so I’m comparing only music videos here. I guess I’m predisposed to prefer the original, since it’s how I first heard the song, and contains a larger percentage of artists that I know and/or identify with. That said, the new version is growing on me. I’m surprised by how much I like the rap breaks, both in the middle and at the end. I think what Wyclef Jean did with Creole lyrics and singing style went a long way toward making this an effort in Haitian relief, and not just a remake of the original song. I like the way they incorporated Michael Jackson into it (the image of Janet singing next to her brother is the first tribute to his legacy that doesn’t feel commercialized in some way), and I love the Ray Charles impression that Jamie Foxx threw in to honor another of the original’s stand-out artists. On the other hand, I’m mystified about why they changed the lyrics to one of the verses (was there a religious objection to “As God has shown us by turning stone to bread?”). I’m surprised by Celine Dion’s choice to imitate, note for note, what Cyndi Lauper did with her part (with apparent coaching from Lionel Richie? ), rather than bringing her own interpretation to the song. I think teen sensation, Justin Bieber, is going to get a big bump in face-recognition from singing the first solo (“There comes a time…”), but that most people will conclude that his voice was too weak to handle it. And I’m deeply, deeply troubled by the acceptance of auto-tune as a musical choice by folks Lil Wayne and others. If melodic singing isn’t his thing, then find someone else to do Bob Dylan’s part, please? That, or for heaven’s sake, someone please improve the auto-tune technology so it doesn’t sound like a robot attempting to sing such soulful lyrics! In the end, I still prefer the original, but I’m glad they both exist. And if the new one is nearly as successful as the original in raising money for a good cause, then I’m doubly glad they put in the time and effort. It seems that country singing superstar Carrie Underwood is engaged to marry the NHL’s Ottowa Senators’ Mike Fisher. Which, in the extremely unlikely event that she chose to change her world-famous name, would make her Carrie Fisher. 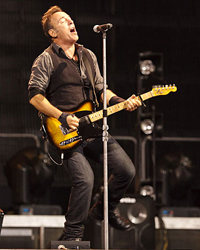 Last night at Giants Stadium, Bruce Springsteen and the E Street Band put on a three-hour extravaganza that proved conclusively that adrenaline can power a rock & roll band every bit as much as an electric guitar. Billed as his farewell to Giants Stadium (a new Giants Stadium is nearing completion in the parking lot next door, and will open for business with next year’s football season), Bruce and the band powered through twenty-eight songs (setlist), providing the required momentum for the near-perpetual motion machine that is his loyal fan base. Ladies & gentlemen, let it be known that there is officially one more trumpeter in the world tonight! Also, may I remind everyone, that the music room in our house is soundproof. 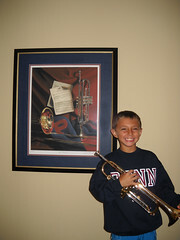 Avery’s goal: to play The Red and the Blue with the Penn Band at Homecoming (November 7 against Princeton). Lessons have begun! Here’s Jon Bon Jovi and Iranian singer Andy Madadian collaborating on “Stand by Me,” sung in both Farsi and English, and meant to be distributed around the world, but especially around Iran. It’s the brainchild of American record producer (and bassist on the recording), Don Was. The site also has the MP3 available for free download.